GIVEAWAYS: Winning WOW! 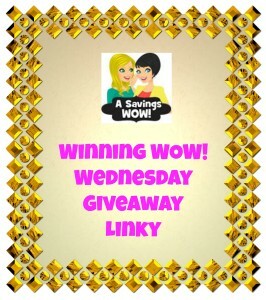 Wednesday Giveaway Linky 07/10/13 | A Savings WOW! Every Wednesday, we’ll share with you some great giveaways going on here and around the blogosphere so you have more opportunities to enter and win prizes! If you would like to share your giveaways with A Savings WOW! readers, please add your link at the below (include your site name, the prize, and the end date). If you don’t see your entry in the linky right away, hit F5 to refresh. Thanks for the linkys! Love your site! Great Linky Participation and great Giveaways!